Rhythm Sticks - What does Chinese Food and Ice Cream have to do with Rhythm? Using Rhythm Sticks really brings life to counting! For many students, rhythm can be boring - it seems to be a bunch of dots and dashes on a piece of paper. To bring rhythm to life for your students, grab a pair of rhythm sticks and a drum. What do you do if you don't have rhythm sticks and a drum? Simple - pick up some Chinese Food and Ice Cream! Chopsticks and ice cream tubs (empty, of course) are excellent tools to brighten any lesson. So, just how does an empty ice cream tub and some chopsticks make a lesson fun? I tried an experiment. First I asked my student Cailin if she would count aloud and clap the first rhythm on Page 37 in her Prep 2 Rudiments Workbook. Sure, she "did it", but she didn't put much enthusiasm into it. Then I handed her a chopstick and an ice cream tub. I asked her to count aloud and beat the second rhythm with the "rhythm stick and drum". Well, suddenly we had pulse! We had enthusiasm! We had so much fun, she tapped the entire page! Rhythm Sticks - DO Try This At Home! Ask your student to count aloud and tap the rhythm using their chopsticks. For rests, the chopsticks will be held apart. For longer note values, ask your student to rub the chopsticks together – one “scrape” along the stick for each count. Tap slowly and steadily – we don’t want to start any fires with our rhythm sticks! 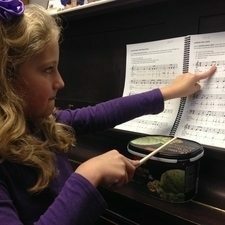 Tapping a rhythm while counting aloud creates a learning connection between what the students SEES on the page, what they FEEL when they play and what they HEAR when the music is performed. 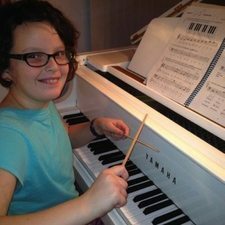 Rhythm Sticks - The Connection That Benefits all Learning Styles. A Visual Learner will benefit from seeing the rhythm AND seeing the movement of the chopsticks as they tap the rhythm. An Auditory Learner will benefit from hearing the rhythm AND hearing the counts as they say the counts aloud. 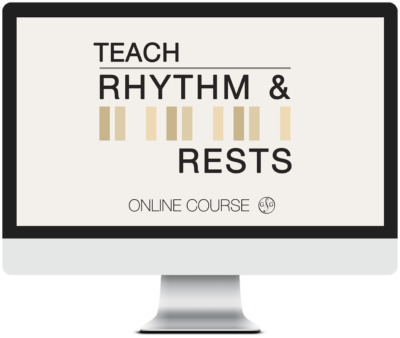 A Kinesthetic (or Tactile) Learner will benefit from rubbing the sticks together to show a half note, dotted half note or whole note value. Feeling the longer sound with their body as they see the longer value of the note on the page will support a stronger understanding of rhythm. For Special Needs Students or for Students who struggle with Tracking (following the music), have the Student point to the rhythm with one hand while using their other hand to tap their chopstick on an empty ice cream container. If you don’t have any chopsticks around the house, order in some Chinese Food and ask for extra chopsticks! If you don’t have an empty Ice Cream Tub…well, Ice Cream goes GREAT with Chinese Food! You deserve a night that doesn’t involve cooking. Mmmm…..Chinese Food….Ice Cream. Sounds like Friday Night’s Dinner is all planned.